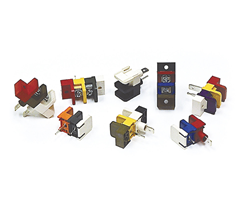 Blockmaster's new modular color-coded terminal blocks feature various styles including PC pin, solder turret, quick connect, insulated quick connect, and non-feed through. The colors available range from white, red, blue, green, orange and yellow to purple, brown, gray and black. The products are molded being made from thermoplastic and their modular design make them customizable. The new modular JB7 Series from BlockMaster features thermoplastic terminal blocks in multiple colors for ease in identifying terminations and preventing costly field wiring mistakes. Terminating the wrong wire to the wrong terminal can be a costly and hazardous mistake, damaging PC boards, components, etc., and creating safety hazards. Low voltage and line voltage connections can easily be mixed up, even by experienced installers. Unfortunately, this happens all too often in the field. However, the innovative “Jelly Beans” solution from BlockMaster prevents such mishaps. The new Jelly Bean® JB7 Series can eliminate this problem for installers by using color-coded terminal blocks. For example, line input 120/220 connections can be made to a white block, while low voltage connections can be made to a green terminal block. If more than one type of low voltage control is necessary, other colors can be used. In addition to color coding, BlockMaster offers screen printing to mark alphanumeric characters on its JB7 Series terminal blocks to further simplify field wiring. The JB7 Series provides a simple and effective means of differentiating field wiring connections by color, custom legends or both. The JB7 Series terminal blocks are modular in construction, allowing customers to obtain the exact length needed. They are molded of sturdy thermoplastic and offered with 7/16” centers (0.437”/11.1 mm). They are available in 10 colors: white, red, blue, green, orange, yellow, purple, brown, gray and black. The blocks are wire ready, with raised screws for 12 AWG to 22 AWG wire. The block housing is thermoplastic (UL 94V-0) and the terminal is made of brass – bright tin over copper plating. Screws are #6-32 steel, zinc plated with clear chromate coating and undercut binding head. Operating temperature range is 130°C max. BlockMaster Electronics manufactures terminal blocks from 1 to 380 amps, including PCB styles up to 130 amps. The company offers over 9,500 P/Ns including PCB, Feed-through and Power Distribution types. BlockMaster’s Value-added Center can also provide quick turnaround on prototypes.